Home / Unlabelled / 9 ESSENTIAL TIPS TO CHANGE BAD HABITS AND BECOME A BETTER MUSLIM. 9 ESSENTIAL TIPS TO CHANGE BAD HABITS AND BECOME A BETTER MUSLIM. What we repeatedly do in our daily life routine is known as habits. Our daily lives are usually a set of habits which we do throughout the day. We have all kinds of habits some are good and some are bad. We don’t realize earlier about bad habits when we realized about them it’s been too late to leave them. Our beloved Prophet Muhammad (SAW) warned us against bad habits and asked us to do good deeds if we want to get rid of from bad habits. The relief from bad habits is to gain religious knowledge and to practice Islam. So, if we spend our days by serving our religion, gain knowledge about it and try to inform others about the beauty of our religion, we will not have time for bad habits. Few things are more difficult than getting rid of bad habits since they are part of our daily routine and personality. It takes days of patience and practice to break old habits because it’s not going to end quickly. In this article, we will discuss some essential tips to change bad habits. Don’t be overwhelmed be patience and remember some simple steps mentioned below which will help you to change the bad habits in a successful way. 1) First of all, identify your bad habits. Two steps are required to identify bad habits. First one is to compare your life with our value system that is whether you are living your life according to the teachings of Islam that is according to Quran and Sunnah of Prophet Muhammad (SAW). The second one is to compare your life with the role model. 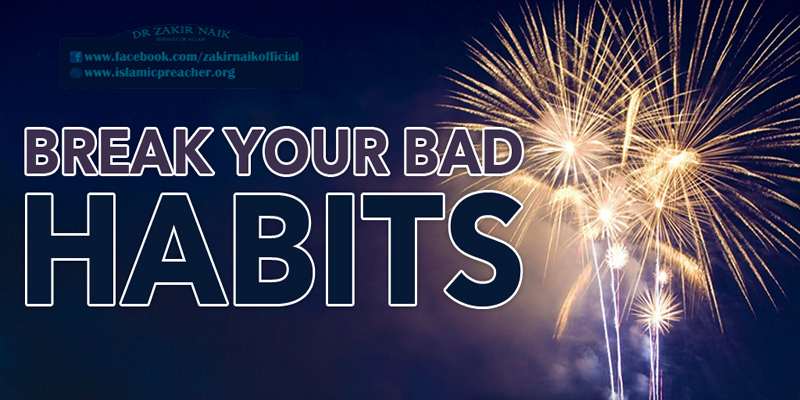 3) Plan to change your bad habits. It should include your reasons for changing; obstacles you will face and also support which will help to achieve your planning to get rid of bad habits. 5) Think yourself as a different person. Tell yourself that you can do better simply motivate yourself which will definitely be going to help you in this manner. 6) Change the habits in a way the other things requires time, effort and a lot of willpower, so it’s wise to make the change slowly rather than in one go. 7) Do Dua at the beginning, all along and till the end – asking Allah Almighty for help and courage to quit all the bad habits and for constancy to prevent a setback. 8) Worship is the most important factor that always strengthens individual to resist his soul and a power that weakens the soul.